I am almost packed & ready for my vacation/friends’ wedding. Today, my husband & I are running around town, tying up some loose ends. We went to the bank, picked up our dry cleaning, & now we are having a sort-of light lunch before I do my “girly thing” & get my eyebrows groomed at the salon. I don’t have caterpillars growing on my forehead, but every girl likes to get dolled up & beautified every now & again. 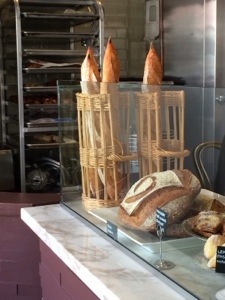 For lunch, we headed to the big city & had a quick bite to eat at B. Patisserie. 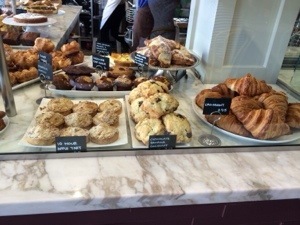 B. Patisserie is a great little bakery that carries all of my favorites (pastries & cakes, of course!). Take a look at these mouth-watering pics! 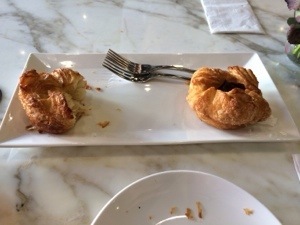 My husband & I started off with 2 pastries: 1 plain Kouign Amann (pronounced: Queen Ah-Mahn) & 1 chocolate filled Kouign Amann. 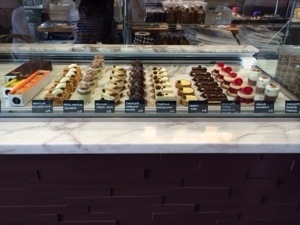 The chocolate filled K.A. wasn’t really to my liking. It was a bit too sweet for my taste. I preferred the plain K.A. 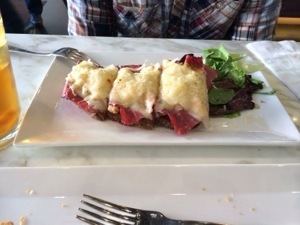 Next, we shared a toasted Reuben sandwich that came with a side of salad…& I have to say, the sauerkraut was out-of-this-world fresh! Normally, I don’t like sauerkraut in my Reuben sandwich, but this particular sandwich was so delicious! To top it all off, we shared a glass of iced tea. Wow! What a lunch we shared. It was a little heavier than we were aiming to have for lunch, but it was all delicious within our wildest dreams. 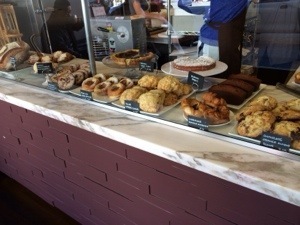 Now, we’re off to the next item on our agenda…to grab a cup of our favorite coffee!! Cheers.